The following examples and illustrations of zoning regulations apply to typical RF1, single detached residential housing, zoned lots. 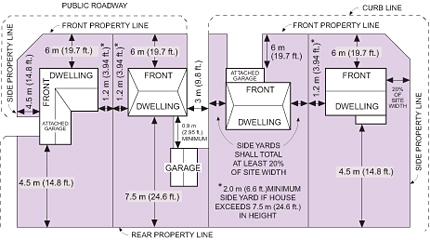 Houses are generally required to be 6m (19.7 ft) away from the front property line and 1.2m (3.9 ft) away from a side property line. However, this required distance can change based on zoning and overlay schedules. Site coverage refers to the amount of property that is covered by buildings. This chart outlines the percentages of property coverage for each type of structure. If your property is zoned differently than RF1, please contact our technical advisors for further information. The height of a house cannot exceed 10m (32.8 ft) or 2.5 storeys in height. This height is measured differently according to specific housing designs in RF1 zoned lots.